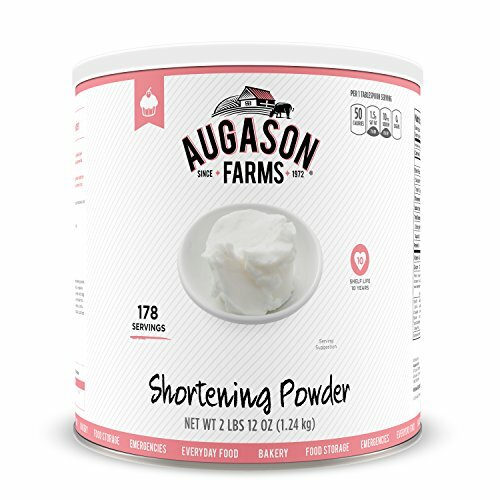 The Augason Farms Shortening Powder 2 lbs 12 oz Number 10 Can is a boon for creating some of the best bakery items anywhere. The ease with which it blends into other dry ingredients makes mixing a dream, and there’s no need to hydrate it first. Keep it on hand to add to any baking recipe calling for shortening for that light, fluffy and flakey texture people love—especially in pie crusts. It does not require any refrigeration and has a much longer shelf life than ordinary shortening, which can quickly go rancid. These virtues make Augason Farms Shortening Powder ideal for everyday use as well as emergency food storage. This is a Certified Gluten-Free product that consists of 178 Servings and 8,900 Calories, with a shelf-life of up to 10 years. It's perfect for Food Storage, Emergencies, Survival, Camping, and Everyday Use! Make the wise decision and let Augason Farms give you a peace of mind that's as indispensable as it is delicious. Family owned and operated since 1972, Augason Farms believes that great taste is a tradition worth preserving. They'll provide you with delicious peace of mind with their food essentials. Please discard oxygen absorber after opening. Best when stored in a cool dry place at temperatures between 55 Degree and 70 Degree F (ideal humidity 15%). Up to a 10 Year Shelf Life! View More In Freeze-Dried Food.